I mentioned to my parents that I was trying to grow a quandong (Santalum Acuminatum). This is a native tree that carries edible fruits. 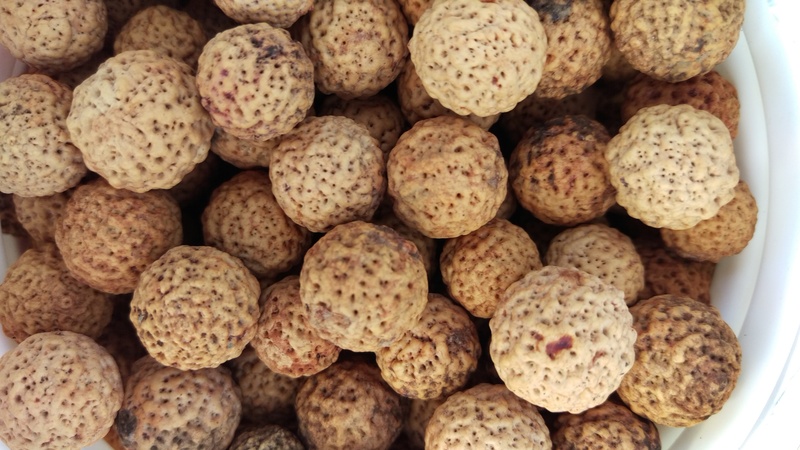 It was, and is, known to Indigenous peoples who ate it, and is one of the better known bushfoods. Some non-Indigenous people call it native peach but to me it is more like rhubarb, and yet unlike rhubarb, being its own thing. It is sour and tangy but the texture is quite firm, and softens with cooking. It was one of the special treats of my childhood. Free food was always exciting in my family but some free food was more exciting. Quandongs were especially good, partly because they often led to quandong pie and pie was a rarity. Plus, the fun of cracking the pits to eat the nuts. When we lived in the goldfields in Western Australia we would forage for these fruits, finding the trees because emus left telltale signs they had been eating them. We had a tree in our yard in one mining town we lived in. My grandmother had a tree in her back yard. But these trees turn out to require a symbiotic relationship with another plant/s and they are quite hard to grow in your backyard (depending on where it is). They resist domestication. My comment to my father resulted in a surprise gift of saved quandong pits. My uncle has a grove of trees at his place further north in our state and preserving them is a huge seasonal task, because the fruits are small (perhaps the size of a hazelnut in its shell–smaller than a walnut in its husk) and the edible part is at best the thickness of orange peel and more often the thickness of mandarin peel around the pit, and about the same texture when raw. 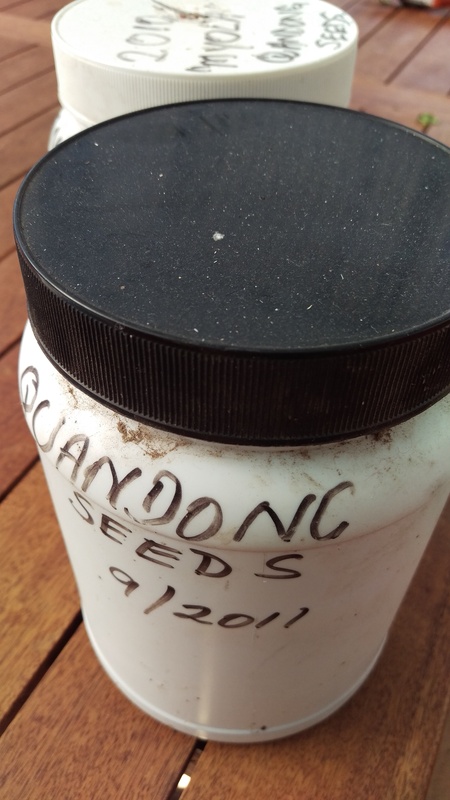 My uncle had seeds dating back to 2011, saved with the location of the original tree marked on them (most were from the farm where my aunt grew up). I have no idea if they are viable. But there were kilograms of them! And then there were about 5 fruits saved in an envelope that Dad had saved from a tree he found at a lookout, that he thought would be extra suitable for a dry site. Well, I took my uncle’s advice–he thinks these are easy to grow but my experience is different–scuffed up the mulch in the front yard where it has taken only 3 years to get our quandong tree to knee height (but the fact it is alive and growing is a triumph), and put them in. I planted lots in the front yard, and then headed out into the neighbourhood planting them in mulched areas all over the place where I presume the chances are slim but success would be awesome! I hope the winter rain and now the spring weather persuades these little pits to seek out the light and a companion plant and all the other necessities of life. A lovely story of persistence and success…of course…you always succeed. Talking of which, congratulations on your first prize at the Royal Adelaide Show for your gorgeous woven string from reeds. It looked ancient, strong and beautiful. And incredibly unique. If only people walking past knew the story of those reeds and the Indigenous heritage of that string making. Thank you so much! Yes, I like that word too. The winning skein is the day lily and sea shell skein. Less sticky outy than the iris leaf skein but still sticky outy all right! Great term! oh yes…that was wonderful with the shells. So happy for your win! Which also reminds me…I gathered up the spent day lily leaves the other day and put them…somewhere…where they’ve probably fried to a crisp in our latest heatwave. Thanks! Probably still fine for string… just sit in a bucket of water until supple. That is a very odd name and history so thank you for another lesson. will you show a picture of your skein? I sort of remember it but… Thanks. No. I haven’t tried. If I had quandongs, I would eat them rather than dye with them every time! But if ever I have a lot of spoiled fruit, I will try it out! Thanks so much for your lovely comment! I borrowed a book on propagation of native plants just recently to support my spring sowings for guerilla gardening and it appear the answer is no in both cases (though these are both good thoughts)–the outer casing of a quandong pit is less like the one on a wattle seed and more like the one on a peach or apricot–really woody and substantial. Quandong jam is sensational, but I think it might be years before I can rise to that! I am preparing to scuff seeds and apply boiling water to others soon. I havent done smoke water yet!